Detects pesky agents and other prowlers. Whether you're deep in the woods, cultivating a "crop" or hiding in your basement, planning a tea party, the Fed is coming for you! The F.E.D. 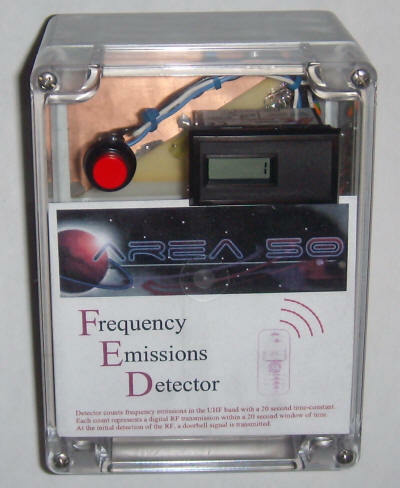 (Frequency Emissions Detector) will detect the signals from agents' fancy-pants digital radios, computers, and phones for a distance of several yards. Place a few of these simple Fed detectors around the area and it will be hard for Special Agent Gibbs to sneak up on you. Even he carries a cell phone, albeit one he swiped from one of his subordinates. The output of the detector may be used to operate a counter for the passive-aggressive type who would rather not be present when the SEALS arrive, and would rather look at the count at a later, safer time. Or, the output can operate a wireless doorbell for an instant "heads-up" or, perhaps, "heads-down" as the case may be. The prototype includes two outputs to drive a counter and doorbell. The doorbell output is a universal solid-state switch that could be used for all sorts of other purposes, including the simple porch light deterrent or the more sophisticated sprinkler system surprise. The device will, of course, detect anyone's cell phone, so the detector really responds to just about anybody with more than two pennies to rub together. Most phones occasionally transmit short bursts to the nearest cell tower, even when the phone isn't in use, so a typical 21st century loiterer will eventually set off the detector. On the other hand, a deer can stare at it for an hour with no effect. Let's face it, even most burglars emit digital signals these days. So, in a sense, the F.E.D. is a human detector. With that in mind, consider using the output to activate a digital camera or video recorder to capture a record of the prowlers. A recorded barking dog or, one of my favorites, a recording of police radio traffic will scare off most crooks. Add some hidden flashing red and blue lights to the police chatter and the culprits will actually run away. The F.E.D. may also be used to detect yourself. If you carry your phone around with you (of course you do), the occasional signal it emits may be used to enhance the effectiveness of your backyard motion detecting lights. Those tend to turn off at inconvenient times, especially on hot evenings and adding the F.E.D. will help to fill in those gaps. That cell signal can be used to control lights and other appliances in the home in synchrony with your movements, too. The simple amplified detector responds to a characteristic of digital communications, the abrupt amplitude shifts that sound like a 'buzz' or white noise in an ordinary AM receiver. As shown in the schematic above, a simple broadband antenna responds from the UHF band through microwave frequency and a biased Schottky diode AM detector drives a high gain audio amplifier. The output of the amplifier is rectified and applied to a comparator with hysteresis. When the rectified voltage exceeds the voltage on the positive input, the comparator output drops low, briefly lighting the LED in the LH1547 and turning off the VN0300. After about 20 seconds, the comparator resets and the CUB3R counts the transition. The long time-constant limits the 'counts' to one per 20 seconds so that the variable digital signal doesn't produce excessive counts. The counter therefore displays the number of 20-second windows that contained RF activity. If a cell phone is in use within range for 3 minutes, the counter will register about 9 counts. The doorbell signal occurs upon first detection of the signal and the switch closes for about a second. 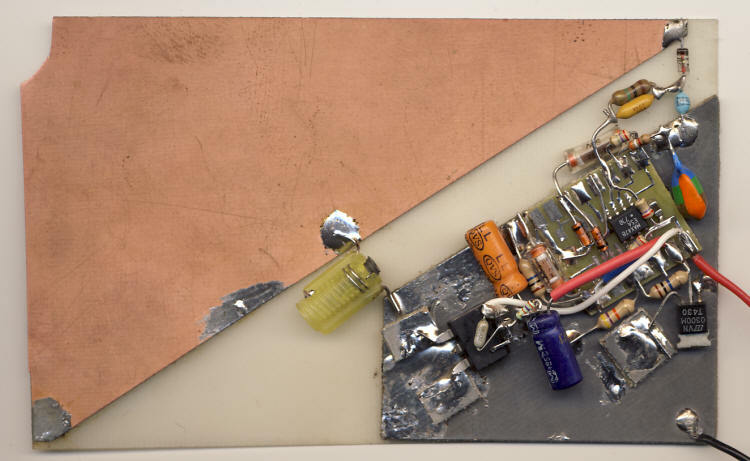 The circuit of the prototype is built on a piece of tinned circuit board with little islands of board soldered into strategic positions. The op-amp is a surface-mount type and a little prototyping board makes it easier to connect other components to the tiny leads. The only critical part of the circuitry is the diode detector section. Notice how the diode and 100 pF capacitor are connected in series between the ground plane and the antenna. The 1 megohm and 0.1 uF capacitor aren't as critical and the rest of the circuitry is quite forgiving. Any sort of construction technique will work for most of the circuit. The antenna and ground plane boards are simply glued to a thin piece of fiberglass board using spray adhesive. The various pieces are installed in a roomy plastic case (not metal). 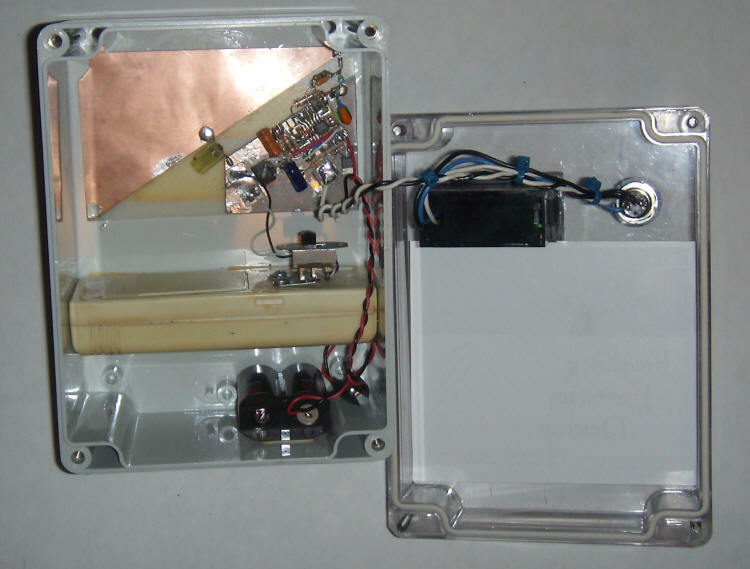 The white box is an old Radio Shack wireless doorbell sender. These have two terminals on the back for connecting an additional button. A quick voltmeter check will determine which terminal is most positive and this terminal should be connected to pin 4 of the LH1547. A slide switch was added in series with one of the terminals to allow for easy disabling of that function. Not shown is a 4.7k resistor in series with a 1 uF capacitor between pin 1 of the op-amp amd an earphone jack, with the ground terminal of the jack connected to the ground plane. This jack allows for the connection of an external amplifier or PC soundcard for listening to the action. It isn't a good idea to add an audio amplifier to the box; there's already a lot of gain in there and additional gain will result in instability, especially if everything is running off the same battery. The antenna is a 'seat-of-the-pants' design that seems to work well. It's made by cutting along the diagonal of a piece of thin, single-sided PCB material measuring 4" X 2.5" but the dimension are not critical. The little cutout at the corner was an attempt to fit the device in a smaller case and should be ignored. The antenna may be any metal or screen with similar dimensions but it should be kept away from other metallic surfaces and components. Perhaps a simple, short wire would work as well! The yellow choke is about 0.1 uH with the adjuster screwed in but a few turns of wire would work fine. Just wrap some bare wire around a pencil. This choke 'shorts' the antenna to ground at low frequency so the detector is only sensitive to UHF and above. It can connect to the antenna and ground plane at any point but keep the leads short. The 5082-2835 is a Schottky detector diode and other RF detector types will work well. Avoid a germanium 'detector' diode unless it is intended for microwave use. The 100 pF may be just about any type but a small ceramic axial part is hard to beat. The 1 uF below the 3.9 k is a non-polar type for low leakage. That 3.9 k resistor may be increased to lower the gain of the circuit is unstable (continuously triggers). Higher gain may be had by reducing the value but expect trouble around 1 k. If you really want to boost the gain, use two, single op-amps and run them on separate batteries. The battery drain of micropower op-amps hardly reduces the shelf life of the battery so two little 6 volt packs will last for years. This prototype uses expensive lithium types that were on the bargain table at the supermarket for $1 each! They have a tremendous shelf life so they were a bargain. The 1N914 diodes may be any silicon small-signal type. They simply rectify the relatively large audio swing coming out of the first op-amp. The 47k sets the threshold of the second op-amp comparator with a lower value giving a lower threshold (more sensitivity). Too low, and the circuit will trigger too easily. The 2.7 megohm resistor from pin 7 to pin 5 gives the comparator hysteresis so that it switches all the way on and off quickly. In fact, it dominates the threshold setting. The 10 megohm ensures that there is a little positive voltage on pin 5 when the op-amp output swings low, about 30 mV. The voltage on the .47 uF must drop below this voltage before the circuit turns back off. The VN0300 may be just about any small-signal N-channel VMOS type. The CUB3R is a general-purpose counting module similar to many others. It has its own internal batteries that last for years. The LH1547 is one type of many available LED-based isolator/switches. Feel free to choose another type that will operate with a couple of mA in the LED. The MAX478 is a micro-power op-amp that draws only 34 uA and has some impressive specifications. Unfortunately, that model is no longer available but many, many other types are. The choice isn't critical but the lower the current consumption, the longer the battery will last. The battery in the prototype is a 6 volt lithium type but others will work fine. A 9 volt rectangular should work but watch out for micropower op-amps that have low maximum power supply voltage ratings. Four penlight cells would be a good choice. Two sets of penlight cells with separate op-amps will make experiments with excessive gain more likely to succeed. Connecting an external speaker amplifier to the output of the first op-amp (pin 1) through a 4.7k resistor in series with a 1 uF capacitor will allow the signals to be heard. If the amplifier has sufficient gain, a low-level hiss should be heard with no signal present. A cell phone anywhere near the thing will give quite a loud buzz when it starts transmitting. Active wireless devices will also produce a racket. It's interesting to listen to a typical Wi-Fi device, the amount of communication required to receive a web page is surprisingly little - just a little 'bzzt' for a typical static page. Many types of cell phones can be heard for quite a distance and the signal comes and goes dramatically as the user moves around. Other antennas could be connected to count or detect other RF signals. For example a tuned circuit and whip antenna could look for nearby AM modulated signals like aircraft communications (see Passive Aircraft Receiver for a front-end design), CB radio, lightning crackles, and any number of digital transmitters. A 'proper' antenna for a particular band should give excellent performance. If power isn't a problem, increase the diode current by lowering the two diode resistors from 2.7 meg and 1 meg to 270 k and 100 k. The bias current will be about 15 uA. The RF detector could be replaced with other sensors like a seismic pickup made from a speaker, a microphone, a photocell or phototransistor, or other transducer that produces occasional weak audio signal bursts that could be counted. © 2009, Techlib. All rights reserved.